Carolina Geranium (Geranium carolinianum) is a member of the Geranium family (Geraniaceae). 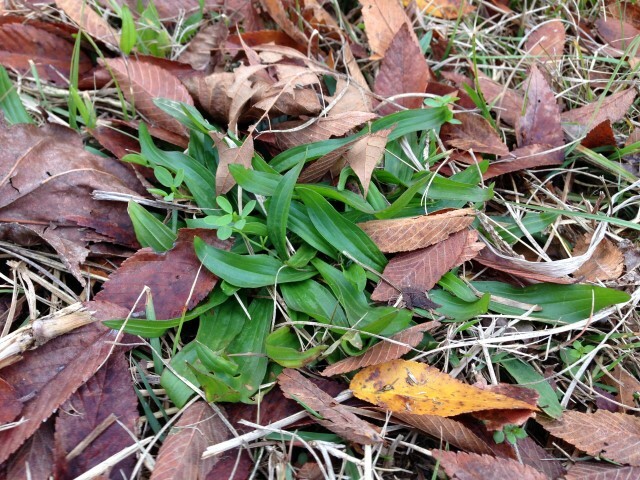 It is a native, broadleaf winter annual. One will typically find Carolina Geranium in poor soils and near dry areas; mainly landscape beds and thinner turf areas. This weed has been used medicinally as well. Mainly, it has been used to stop bleeding and sooth sore throats when crushed. 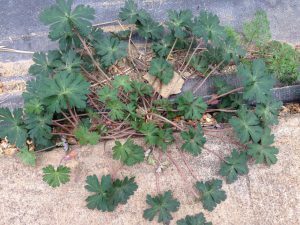 Carolina Geranium is a diffusely branched weed standing about 1” tall. This geranium has long petiole stems that are often pink to reddish with hairy stems that flow into a finely divided palmate leaf. The flower also had a little inconspicuous pink bud. This weed is most commonly identified by its “stork’s-bill” seed head. It is a long, hairy, pointed head that will produce multiple seeds that contain hard seed coats. Carolina Geranium is a tough weed to control. Not only does the seed have a hard-coated membrane, which can withstand prolonged dormancy in the ground, but it also is hard to control with herbicides once established. Cultural practices include frequent mowing and hand pulling, while herbicide options include metsulfuron and trifloxysulfuron-sodium . Hairy bittercress, Cardamine hirsute L., depending on its location, is a winter or summer annual weed. It is most often found in landscape areas, container-grown plants, and greenhouses. Its stems branch at the base and can achieve a height of 12 inches. 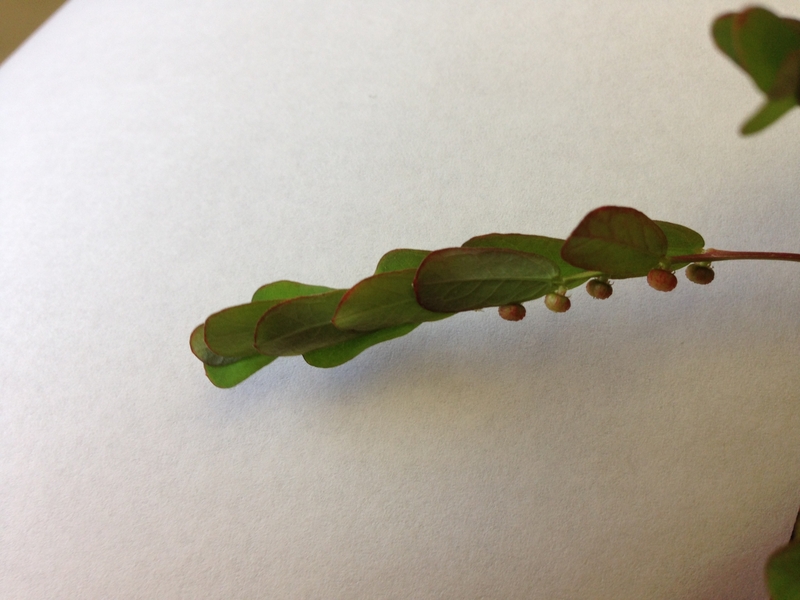 Growing on the central leaf stem is 2 to 4 pairs of leaflets that are alternately arranged. Each leaf occurs on a petiole that is distinctly hairy. One should take note that the upper leaves will be noticeably more hairy than the lower leaves. This weed flowers in clusters while each individual flower is small (2-3mm) and composed of 4 white petals. The fruit (seed capsule) is a silique, which is a long, narrow capsule with many seeds. Siliques can explosively spread the seed as far as 10 feet from the parent plant. It tends to grow in disturbed soils and will form dense mats of rosettes over an area. Hairy bittercress has long, narrow siliques and round leaflets that are alternately arranged. 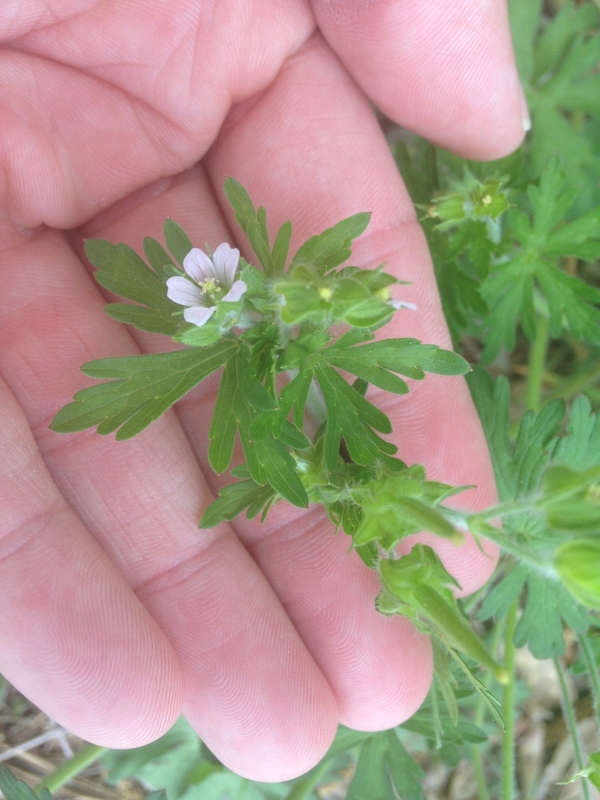 Also, this weed has white flowers with 4 petals in dense clusters at the end of the stem. Improving drainage can be a great way to deter this moisture-loving weed. 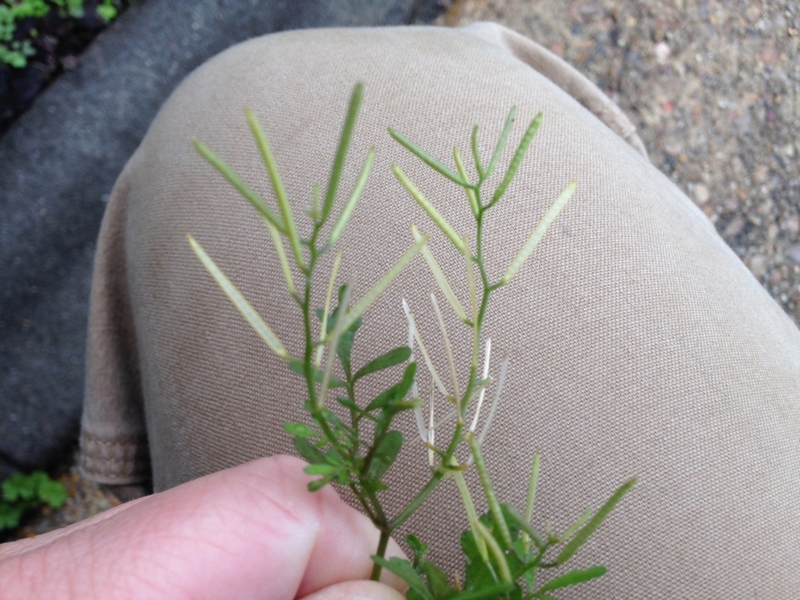 If you have severe infestations of hairy bittercress, it may require chemical treatment. Post emergence herbicides such as 2-4 D, triclopyr, clopyralid, dicamba, or MCPP should be used. Finally, don’t forget that wild hairy bittercress is edible! It is best to gather in early spring or late fall when the leaves are tender. It adds a peppery bite to raw salads, and can be cooked and added to soups. Chamberbitter (Phyllanthus urinaria) is a member of the Spurge family (Euphorbiaceae), sometimes referred to as gripeweed, leafflower, or little mimosa. It is native to Asia, but has found its way across the southeast and into Texas. Chamberbitter is a warm-season broadleaf annual and usually emerges around May or June when the soil temperatures have warmed to approximately 70oF. 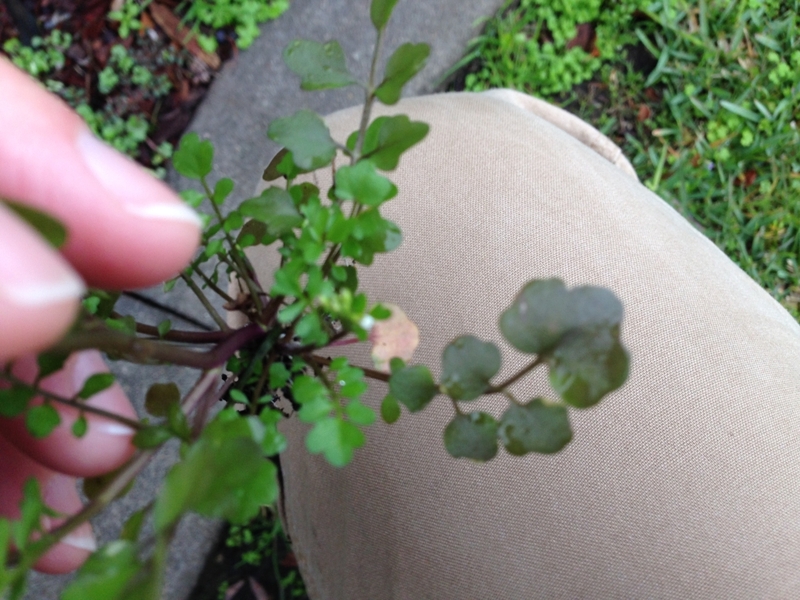 It spreads by seeds that are located on the bottom side of the branch. Ornamental beds and turfgrass are the two most common places to find Chamberbitter. In South America, this plant is believed to be good for medicinal purposes; specifically, treatment of kidney stones. What does Chamberbitter look like? Chamberbitter can grow tall and thin, which can be aesthetically unpleasing. The leaves grow in two alternating rows. Leaves are thin and smooth which resemble the seedling of a mimosa plant. It is best identified by the fruiting structures on the underside of the branch which produce numerous seeds. These seed capsules can explode and spread seeds over a large area. Also, like some spurge, if you break the stem, it will produce a milky white sap. How do I control Chamberbitter? Chamberbitter can be a difficult weed to control. It is drought tolerant and grows rapidly. Seeds on the underside of the plant can be produced in as little as two weeks. If making a pre-emergent herbicide application, Chamberbitter control is often unreliable because it germinates later in the spring than most summer annual weeds. About – Yellow Woodsorrel (Oxalis stricta) is a medium-sized edible plant that thrives in lawns and woodlands across the United States and Canada. It can also be found in Europe, Africa, Asia, Japan and New Zealand. The flowers can be used to make yellow, orange, red and brown dyes. Another common name is “Oxalis”, which means “sour” due to its oxalic acid content. Oxalic acid can be toxic when consumed in large quantities because it inhibits the absorption of calcium. Yellow Woodsorrel is a cool season perennial in the Woodsorrel family (Oxalidacea), but may act as a summer annual in certain environments. It reproduces by seed and occasionally stems. Identification – Yellow woodsorrel introduces itself from a taproot and forms small, erect, bushy plants up to 20 inches tall. The stems are slender, gray-green, pubescent, slightly ascending, and branched at the base. They will occasionally root at the nodes. 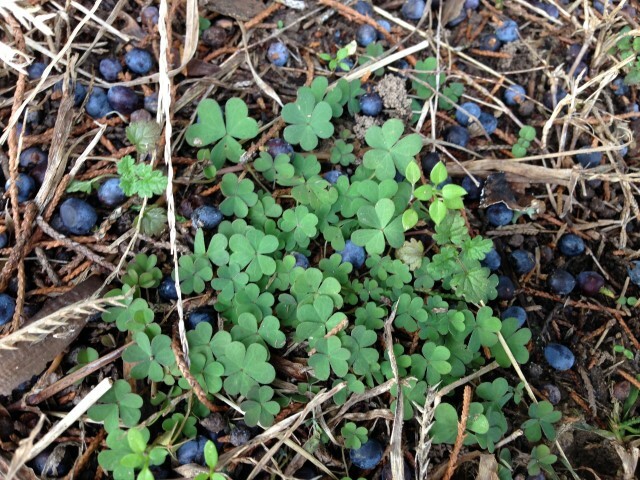 The leaves of yellow woodsorrel are alternate with three heart-shaped leaflets. They are pale green, up to 4/5 inch across with long petioles. The flowers are yellow with five petals and are up to ½ inch across. It is often mat forming and more common in cools-season turf species, such as tall fescue. It can be very common in greenhouses and container nurseries because its seedpods can distribute seeds up to several feet. Cultural– Hand-weeding is effective before seeds are formed. As always, the best weed control is a dense turf sward. Proper mowing, fertilizing and irrigation ensure vigorously growing turf. Many pre and post-emergent herbicides are effective. 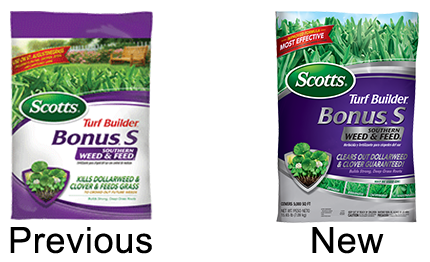 And many 3-way mixtures sold at in lawn and garden sections (often labelled as Trimec Southern or for Broadleaf weed control). Identification: Buckhorn Plantain is a rosette-forming perennial herb with leafless, hairy flower stems. The fruit is composed of egg shaped capsules 1/6” long containing either one or two seeds per flower. Leaves are football shaped and stand between three and 10 inches long with short hairs that spiral around the stem. The stalks grow upwards of 2 to 2.5 inches and have a dominant, strong taproot. 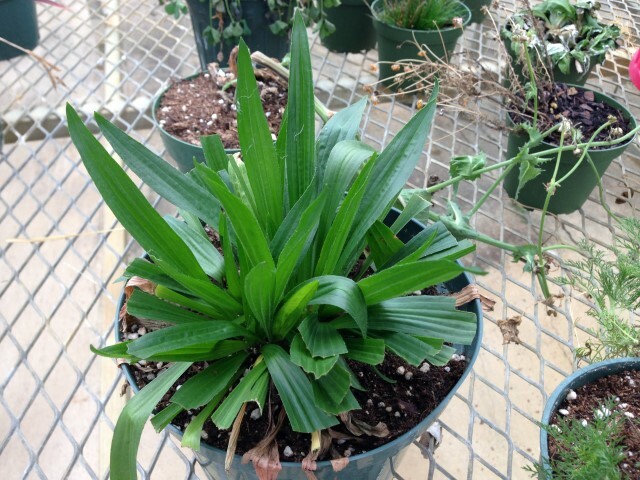 Characteristics: Buckhorn Plantain is characterized as being drought tolerant. Typically, the plant reproduces via seed and disseminated through airborne carriers or water. The seeds are oblong shaped and brown with one side having a glossy, light brown stripe. Habitat: Environmental conditions favoring the growth of Buckhorn Plantain are vineyards, orchards, gardens, urban areas, turf, foot paths, and crop fields in general. Typically, Buckhorn Plantain prefers areas that have been plowed or disturbed in any manner. Control: Control of Buckhorn Plantain consists of two measures, either pre-emergence or post-emergence herbicides. For pre-emergence control, Isoxaben is a good choice for minimizing germination. Post-emergence control includes 2,4-D, Triclopyr, MCPA, and MCCP. Typically, 2,4-D has good activity on Buckhorn Plantain, while Triclopyr, MCPA and MCCP reduces plant vigor. Buckhorn Plantain can be a difficult weed to control, but combining cultural practices, such as hand pulling, and herbicide use is the best approach for control. Star-of-Bethlehem belongs to the Lily family (Liliaceae), which is closely related to wild garlic and wild onion. 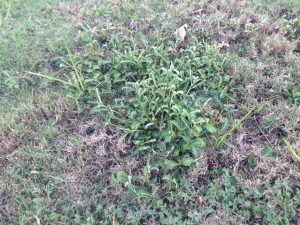 It has origins as a cool season perennial ornamental plant, but it has grown into an aggravating weed in home lawns, golf courses, and athletic fields. This plant spreads by seeds and underground bulbs. It emerges in the winter to early spring and flowers as temperatures increase, but once summer arrives the plant will enter dormancy. This plant may be poisonous to grazing animals because it contains high levels of cardiac glycosides, especially in the bulbs. Often confused with wild onion and wild garlic, Star-of-Bethlehem can be distinguished by darker green leaves, a pale green to white mid-rid, and is covered with a waxy coating. 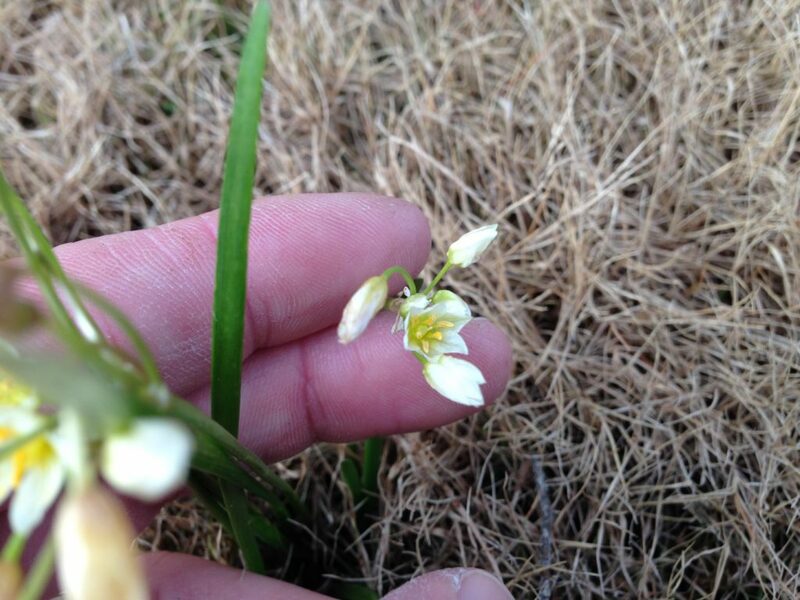 When Star-of-Bethlehem is crushed or mowed it does not produce a strong odor. Leaves are narrow and linear and will blossom a white, six petal flower with distinct green stripe underneath the petals in the spring. Star-of-Bethlehem mainly produces from bulbs and rarely from seeds. The bulb of Star-of-Bethlehem is noticeably larger than that of wild onion and wild garlic. Mowing: prevents flowering and seed production. Come winter, be sure to raise the height at least 2 inches. Hand picking, constantly, but make sure you pull out the entire bulb and bulblets. Dismiss and products containing Sulfentrazone have been shown to act more rapidly than other products. Chickweed (Stellaria media) is a member of the pink or carnation family (Caryophyllaceae). Chickweed is typically 3 to 8 inches tall and can form a mat up to 16 inches in diameter. Leaves are pointed and oval shaped, with entire leaf margins that will grow in pairs from a half of an inch to one inch long. Small white star-like flowers occur in clusters with five deeply lobed petals that can grow up to an eighth of an inch in diameter. These flowers will develop into capsule-like fruits that contain seeds. Chickweed prefers moist soils, but it can be found in open sunny areas as well as shaded areas. 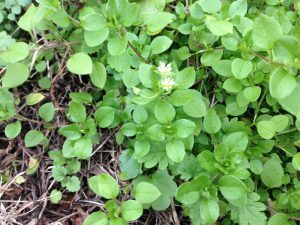 Chickweed can be found worldwide in any type of climate; however, in Mississippi, it is considered to be a winter annual. It is commonly found near buildings, trees or in landscape beds. 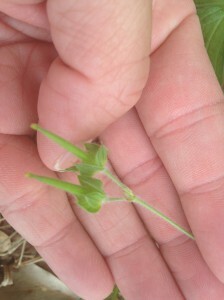 Chickweed propogates by seed. It can produce as many as 15,000 seeds per plant. 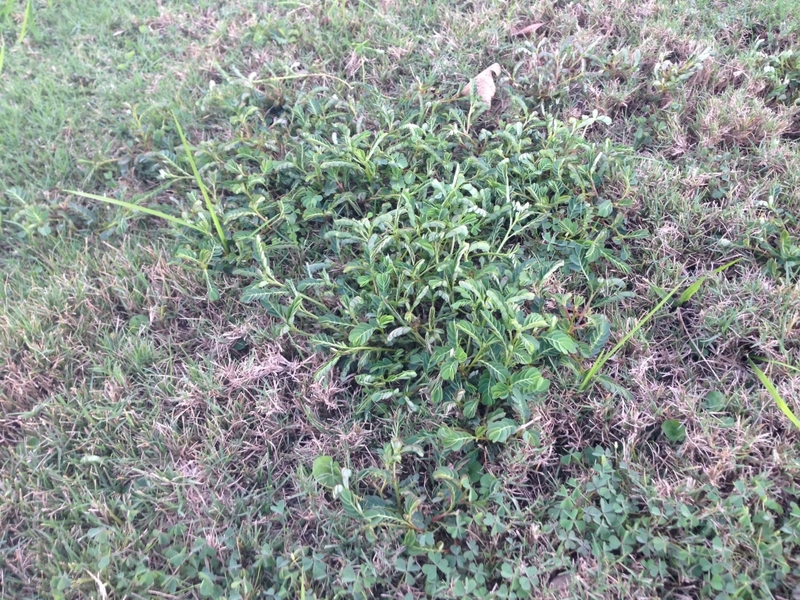 There are three types of control for chickweed: cultural, biological, and chemical. Cultural control can include hand weeding; however, this is most effective while the weed is in its juvenile state. If hand pulled when mature, it can cause significant seed dispersal. In a landscape environment, a two inch layer of mulch can suppress new weeds. In maintained turf, the best prevention is to monitor irrigation and fertilizer applications in order to maximize turf health and competitiveness. For biological control, grazing has been reported as an effective tool. Chemical control requires both pre- and post-emergence herbicides. Balan, dimension, and barricade are preemergence herbicides that have good activity on chickweed. 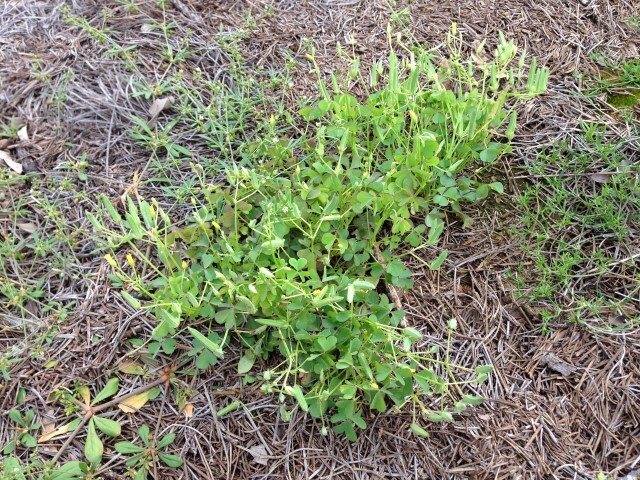 Dicamba, Trimec, Surge, and Speedzone are selective post-emergent herbicides often used to control chickweed. View current weed control guidelines for Mississippi at MSUcares.com. Last updated February 17th, 2014. Technical problems, contact support.